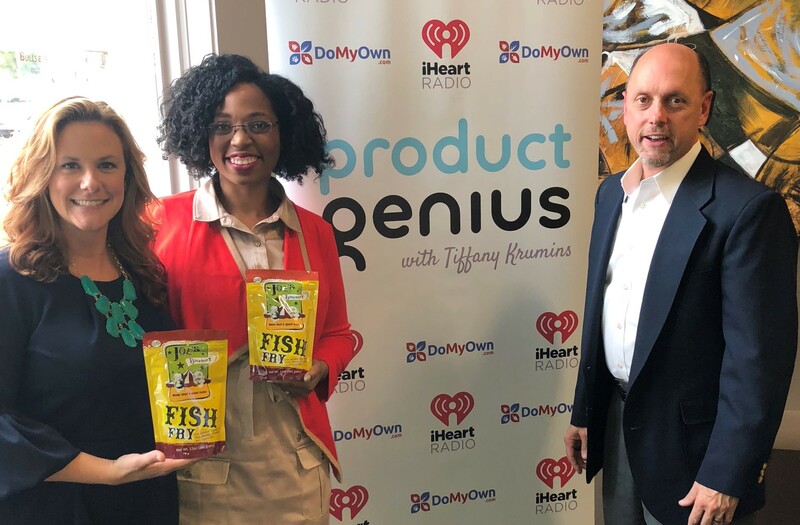 Lawrenceville, GA – October 2018 – Great podcasts of Product Genius with Tiffany Krumins was taped today. Howie Busch, Founder – DudeRobe.com, and Maranda Dowell, Key Account Executive – Joe’s Gourmet Fish Fry were the product-based business owners. Although Howie describes himself as ‘the least handy inventor,’ he has developed a masculine and very comfortable robe, pants, and shorts for guys (www.duderobe.com). This robe is a combination hoodie and bathrobe and perfect for lounging around the house. He not only brought the idea onto Season 9 of Shark Tank, but is also now fulfilling orders directly to consumers as well as to retail locations. His expertise is not just product development; he’s done a Kickstarter campaign and negotiated a deal for a now popular athletic brand. Simply put, Howie helps others with their product launches and licenses. Also on Season 9 of Shark Tank was Joe’s Gourmet Fish Fry. While the product is named after Joe Senior, it was Joe Junior’s determination and restaurant background that started it all. After Katrina wiped out his two New Orleans restaurants, all he had were two mobile fish fryers. He went to events and sold plates of catfish with breading that as Maranda (his partner and wife) put it “makes food taste good.” The coating was such a success that people were demanding it out the back door in plastic bags! Then Maranda jumped in with her marketing experiences and things really took off. Now you can find it at Publix, Winn Dixie, HEB, Meijer, other grocery stores, select Walmart stores, Amazon, and their website (www.joesgourmet.com). If your fulfillment process isn’t quite right and you want to explore improving the process, FSI is here to help. When you partner with FSI, you are partnering with a company centered on providing fulfillment and distribution programs that exceed industry norms and client expectations. Our fulfillment management team is experienced in providing unique and customized solutions that address our client's specific fulfillment and distribution needs. From our customized on-line programs, to our near 100% order picking accuracy, the team at FSI is focused on demonstrating excellence at every step of the process. FSI is a fulfillment company you can depend on to get the job done right each and every time. Reach us at 800-979-9012 or info@fsifulfillment.com. You can find previous shows by visiting Business Radio X - Tiffany Or check out at iHeartRadio - Product Genius for other great podcasts by Tiffany Krumins and her slightly annoying co-host, Steven Julian, that help product-based entrepreneurs succeed.